This tradition is very much in keeping with the spirit of UEA when ‘Do different’ was adopted as the fledgling university’s motto in 1963. ‘Do different’ can be seen embedded in the foot of our coat of arms, along with three gold crowns symbolising the ancient kingdom of East Anglia, an angel holding an open book to indicate a place of learning and Norwich Castle at its centre. Ever since Thistlethwaite had come to Norwich he had enjoyed the Norfolk dialect saying ‘in Norfolk we du different’. He used the phrase as the theme in an early speech and won praise from the Eastern Evening News which ran with a headline ‘Du Different a Virtue’. The expression is based on the independent spirit of East Anglians who prefer the course of action they feel to be right to that which is conventional. When encouraged by the dean of BIO, Thomas Bennet-Clark, Thistlethwaite jumped at the chance to adopt it, though after going through the College of Arms mill it emerged as ‘Do different’. Adrian Smith’s letter home, 1964. It was found to be a contentious choice, some thinking it was making fun at the Norfolk dialect. Others praised it for expressing the independent nature of the local character. UEA’s attempt to produce a motto which broke with tradition, yet aimed to please, won it instant recognition for living up to its motto from the outset. The rightness of the choice, as Thistlethwaite pointed out many decades later, has been proven over time, a motto not only remembered but quoted; and in this week of ‘Do Something Different’, brought into play. Thistlethwaite, Frank. Origins: a personal reminiscence of UEA’s foundation. UEA Collection/SMI (student’s correspondence, 1963-1966)]. This summer the Library is undergoing yet another makeover. Around 180 new and varied study spaces will be created, mainly on Floor 01. This has been made possible as over two miles of open-access rolling stack shelving will be introduced on Floor 02 (just alongside the Archives). Once the dust has settled and the stock re-shuffled, there’ll be more light, more colour and an improved layout on Floor 01. The Archives also stands to re-gain over 250 metres of shelving in its climate-controlled store. Keeping up with ever increasing student numbers and changing methods of study is an ongoing challenge for a Library which was built almost 50 years ago. The Plan was for a University which would contain three thousand students in ten years with the possibility of expansion to six thousand thereafter. In 2017 we now have over 16,000 students, all requiring to be connected to a device or screen of some sort or other. Each of the six floors has had its turn for re-design, a splash of colour, more comfortable seating, with better access to computers and technical facilities. We’ve introduced individual and group study rooms and even a small cinema. In short, we have grown and we have improved, more than once or twice. Let’s take a look back. Architects Denys Lasdun and Partners publish a Development Plan for the University. ‘Topping out’ of the Library building by Frank Thistlethwaite (Vice-Chancellor). Official opening by Lord Franks (Chancellor) as Library Phase I is completed. Completion of Library Phase II (Architects Feilden & Mawson). The original block doubles in size to form a near square and extends southwards. The two halves join to form one seamless building and it comes as a surprise that it is by two different architects but with Denys Lasdun’s design. Opening of the LaRC (Learning and Resources Centre), Floor 02. Floor 0 refurbishment. The Reception and Helpdesks are amalgamated and positioned near the entrance. Official opening of the extension and Archives. The ‘extension’ on the east side transforms the rather square looking building into a dog’s leg. It offers smooth access between the old and new parts on all floors; this part of the Library is light and airy with extensive glazing and solar shading. Its cedar and stone cladding offers a break from the severe grey concrete. The new Archives reading rooms, office and climate-controlled store (Floor 02) are opened by Rose Tremain (who later is appointed Chancellor). [Architects: Shepheard Epstein Hunter; construction by Kier Eastern]. Opening of refurbished Floor 0 and the Silent Reading Room on Floor 1. Opening of the Silent Reading Room on Floor 02. Opening of large Postgraduate Study Rooms on Floors 2 and 3. Refurbishment of Floors 01 and 02. Details on the Library Space Project and the changes taking place in summer 2017. National Sporting Heritage Day aims to raise awareness of the rich sporting heritage that exists in the UK. We’re taking a quick run through our collections to see what might be highlighted. Most well-known is the wild swimming in the Roger Deakin Archive but there’s also the establishment of the Theta Sailing Club in Norfolk (see our earlier blog). 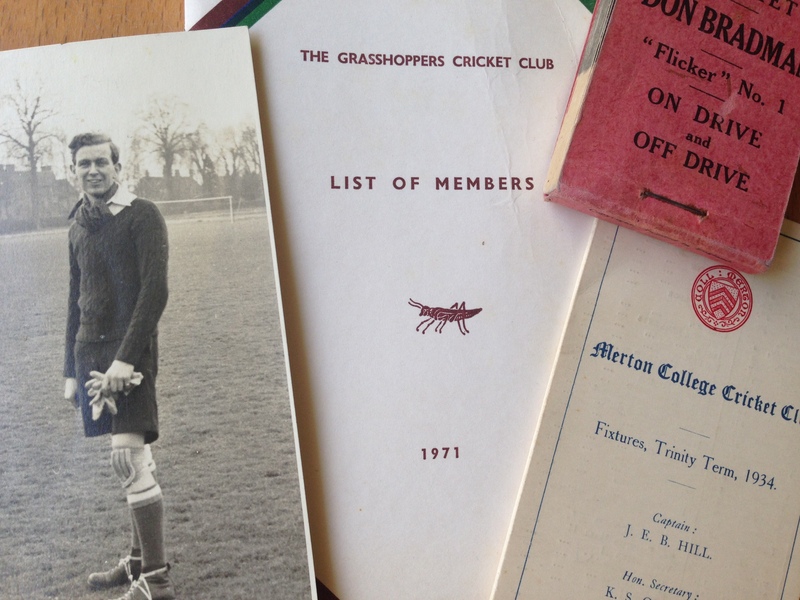 Cricket and football memorabilia from the 1930s are included in the papers of John Hill (Con. MP), with additional correspondence included up to 1999. Hill was Captain of Merton College (Oxford) Cricket Club and also played for the Grasshoppers Cricket Club, Woking, and Esher Cricket Club. Hill played goalkeeper for Corinthian Football Club, and for Oxford University where he received a “blues award”. He played for and was a committee member of Old Carthusian Football Club (Charterhouse old boys). Memorabilia from all these clubs include fixtures booklets, dinner menus, photos, correspondence, and press-cuttings. A tiny “Flicker” book shows Don Bradman in motion and teaches “on drive and off drive”. 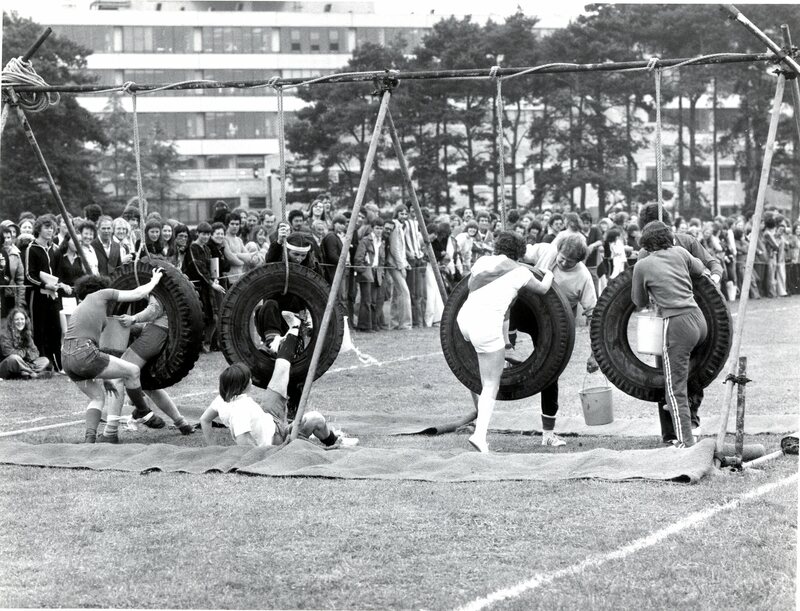 The UEA Collection contains some slides and photographs of individual and group sporting activities at UEA as well as some fun sports days for staff, all of them long before the current Sportspark was built. 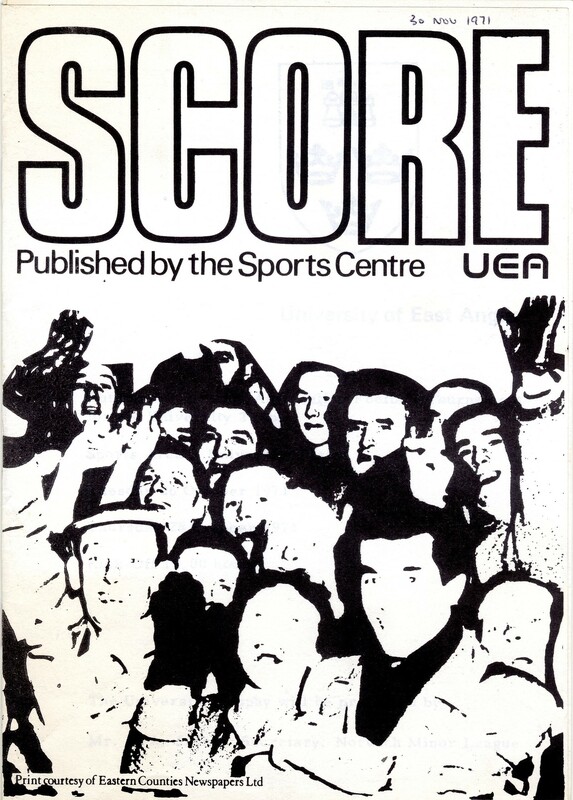 Journals from the 1970s include UEA Sport and Score.